This past shabbat, on which we read Parshat Ki Tisa, we were discussing the parshah (the weekly Torah portion read in synagogue) at dinner. My five year old son commented on the finale of the gripping narrative of Moses’ (Moshe’s) quest for forgiveness on behalf of the Israelites, which ultimately results in Moshe having a glowing face. Shaya commented that Moshe’s face was like the Moon! This struck us–his entirely unbiased, nachas-shepping parents–as a totally brilliant thought! כח וַיְהִי-שָׁם עִם-ה’ אַרְבָּעִים יוֹם וְאַרְבָּעִים לַיְלָה–לֶחֶם לֹא אָכַל, וּמַיִם לֹא שָׁתָה; וַיִּכְתֹּב עַל-הַלֻּחֹת, אֵת דִּבְרֵי הַבְּרִית–עֲשֶׂרֶת, הַדְּבָרִים. כט וַיְהִי, בְּרֶדֶת מֹשֶׁה מֵהַר סִינַי, וּשְׁנֵי לֻחֹת הָעֵדֻת בְּיַד-מֹשֶׁה, בְּרִדְתּוֹ מִן-הָהָר; וּמֹשֶׁה לֹא-יָדַע, כִּי קָרַן עוֹר פָּנָיו–בְּדַבְּרוֹ אִתּוֹ. ל וַיַּרְא אַהֲרֹן וְכָל-בְּנֵי יִשְׂרָאֵל, אֶת-מֹשֶׁה, וְהִנֵּה קָרַן, עוֹר פָּנָיו; וַיִּירְאוּ, מִגֶּשֶׁת אֵלָיו. לאוַיִּקְרָא אֲלֵהֶם מֹשֶׁה, וַיָּשֻׁבוּ אֵלָיו אַהֲרֹן וְכָל-הַנְּשִׂאִים בָּעֵדָה; וַיְדַבֵּר מֹשֶׁה, אֲלֵהֶם. לב וְאַחֲרֵי-כֵן נִגְּשׁוּ, כָּל-בְּנֵי יִשְׂרָאֵל; וַיְצַוֵּם–אֵת כָּל-אֲשֶׁר דִּבֶּר ה’ אִתּוֹ, בְּהַר סִינָי. לג וַיְכַל מֹשֶׁה, מִדַּבֵּר אִתָּם; וַיִּתֵּן עַל-פָּנָיו, מַסְוֶה. לד וּבְבֹא מֹשֶׁה לִפְנֵי ה’, לְדַבֵּר אִתּוֹ, יָסִיר אֶת-הַמַּסְוֶה, עַד-צֵאתוֹ; וְיָצָא, וְדִבֶּר אֶל-בְּנֵי יִשְׂרָאֵל, אֵת, אֲשֶׁר יְצֻוֶּה. לה וְרָאוּ בְנֵי-יִשְׂרָאֵל, אֶת-פְּנֵי מֹשֶׁה, כִּי קָרַן, עוֹר פְּנֵי מֹשֶׁה; וְהֵשִׁיב מֹשֶׁה אֶת-הַמַּסְוֶה עַל-פָּנָיו, עַד-בֹּאוֹ לְדַבֵּר אִתּוֹ. 28 And he was there with the LORD forty days and forty nights; he did neither eat bread, nor drink water. And he wrote upon the tables the words of the covenant, the ten words. 29 And it came to pass, when Moses came down from mount Sinai with the two tables of the testimony in Moses’ hand, when he came down from the mount, that Moses knew not that the skin of his face sent forth beams while He talked with him. 30 And when Aaron and all the children of Israel saw Moses, behold, the skin of his face sent forth beams; and they were afraid to come nigh him. 31 And Moses called unto them; and Aaron and all the rulers of the congregation returned unto him; and Moses spoke to them. 32 And afterward all the children of Israel came nigh, and he gave them in commandment all that the LORD had spoken with him in mount Sinai. 33 And when Moses had done speaking with them, he put a veil on his face. 34 But when Moses went in before the LORD that He might speak with him, he took the veil off, until he came out; and he came out; and spoke unto the children of Israel that which he was commanded. 35 And the children of Israel saw the face of Moses, that the skin of Moses’ face sent forth beams; and Moses put the veil back upon his face, until he went in to speak with Him. Moshe’s face shines as a result of his experience and status of being closely associated with the Divine and, I will claim, with the Torah. His last 40 days had just been spent on Mt. Sinai coming closer to God than anyone else ever has. (And that’s after the first 40 days that he probably thought – at the time – was as close as possible!) He returns to the Israelites’ camp not only having achieved his mission of gaining forgiveness for the sin of the golden calf, but also having learned the Torah that he is to spend the rest of his life teaching and for which he is now the unique conduit for Divine transmission. Moshe’s face shining after his exposure to God’s glory is presumably a reflection of God’s own glory, kiviyachol – if such a thing is possible. This, then, is the analogy to the Moon: The Moon does not produce its own light (in the visible spectrum, at least.) It’s “shining” is a reflection of the Sun’s light. However, there are further similarities in the Moshe – Moon analogy. After the Israelites’ initial reaction of fear to Moshe’s shining face, he wears a veil to hide it, presumably for the rest of his life. The Torah tells us that when speaking to God, Moshe removed the veil and then replaced it when he returned to talk to the people. Moshe’s veil makes his shining face even more like the Moon. As it goes through the monthly waxing and waning cycle, the Moon’s “face” is also partially “covered” – i.e. in darkness – most of the time and it’s “shining” is hidden. Only when we see a full Moon is the “shining face” of the Moon fully revealed. As the Moon passes through its monthly cycle, we see it go from completely dark to completely illuminated and back again. In fact, one half of the Moon is always illuminated by the Sun’s light (except during a lunar eclipse when the Earth’s shadow blocks it.) The angle of the Moon’s location in its orbit relative to the Earth and Sun determines how much of the illuminated side we are able to see from Earth, thus resulting in the different phases of the Moon. The diagram above shows how the positions of the Moon as it orbits Earth produce the corresponding Lunar Phases seen from Earth at the given times of the month. The Jewish/Lunar month begins with a “new Moon” – which is approximately when the earliest sliver of the Moon becomes visible after the astronomical phase called “New Moon”. The Moon is always full at (or near) the middle of the month. 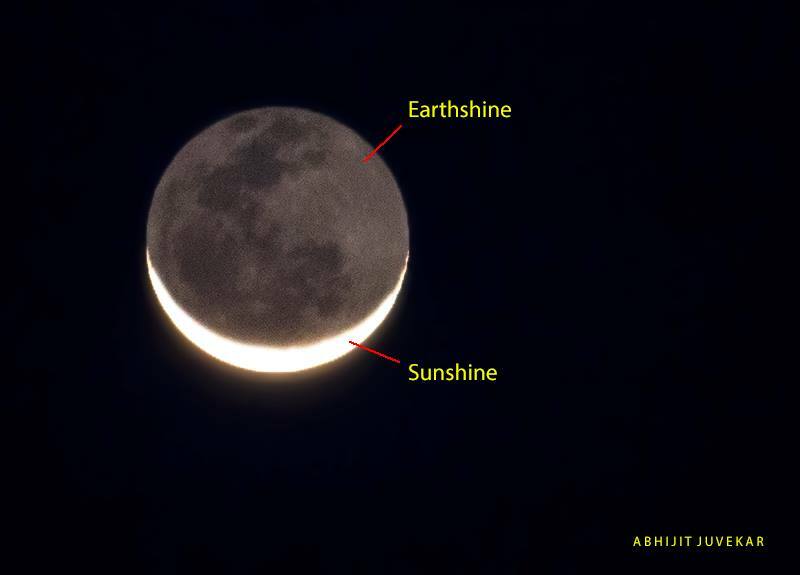 However, even when the Moon’s “face” that we see is mostly in shadow, there is still a slight reflected glow on the dark portion; this is what is called “Earthshine”. This is the “twice reflected” light, sunlight reflected off the Earth that slightly illuminated the dark part of the Moon that is facing the Earth. Here’s an interesting aside: The late astronomer Carl Sagan and others have used the observed Earthshine spectrum as a proxy for potential extrasolar planets to try and detect spectral signs of life on Earth. Observing the spectrum of Earthshine (averaged over a whole of a side of the Moon) provides the equivalent of an averaged absorption spectrum of the Earth. This is similar to the types of observations that could be expected in any future early telescopic imaging observation of a spatially unresolved spectrum of an extrasolar planet, since the apparent size of the planet will most likely be a point or less than a single pixel. בָּרְכֵנוּ אָבִינוּ כֻּלָּנוּ כְּאֶחָד בְּאור פָּנֶיךָ. כִּי בְאור פָּנֶיךָ נָתַתָּ לָּנוּ ה’ אֱלהֵינוּ תּורַת חַיִּים וְאַהֲבַת חֶסֶד. וּצְדָקָה וּבְרָכָה וְרַחֲמִים וְחַיִּים וְשָׁלום. Bless us, our Father, all of us as one, with the light of Your countenance. For by the light of Your countenance You gave us, L-rd our G‑d, the Torah of life and loving-kindness, righteousness, blessing, mercy, life and peace. God “gave us the Torah by the light of His face”! Moshe continues the transmission of God’s Torah, so his face shining is a continuation of the “light of God’s face” by which He gave us the Torah. Moshe, is after all, the one who brought the Torah down from Sinai and taught it to everyone. Earthshine then is analogous to the Torah She’be’al Peh – the Oral Torah – also seen reflected on the Moon – Moshe’s face. How so? It is a less bright/obvious side of the Torah, produced by the light reflecting off of the face of the Earth – from the observers/learners of the Torah shining off of the “veiled” face of Moon / Moshe. Even when the shining face of Moshe’s directly divinely transmitted written Torah is hidden, there is still the shining of the Oral Torah that reflects off the Earth – the “face” of the Jewish people themselves, who constantly produce a more subtle but still Divine light of their own Torah as they study and learn God’s Torah.